Auto-run Virus usually carried by your Flash Drives, Memory Cards and other USB devices that infects your computers if you are not aware. This type of virus has three common hidden file to execute the autorun.inf, kavo.exe and ntdelect.com. You can't easily view them in your system because they're hidden and usually disable your Folder Option to make them visible. Now, your antivirus might detect it if you scan your USB before opening your files or else the Autorun Virus directly infect your system. We know that Flash Drives ( USB) carries this types of threat butwe can't refrain using it because of the convenience. Now, I am going to to tell you what are the best softwares that may help you to block and remove autorun virus from your computer.Your antivirus could protect your system out of various threats but there are simple programs designed to more focus on USB threats. USB Virus Scan - This is among the best software against autorun virus base on my experience. 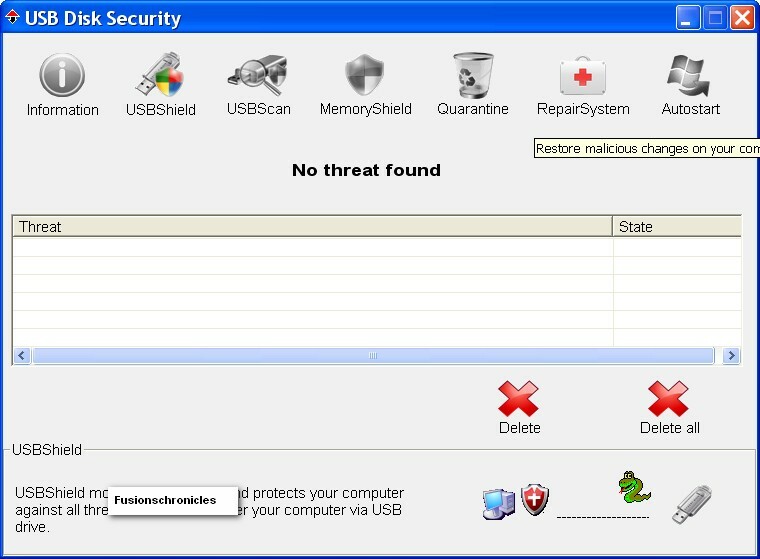 USB Virus Scan provides real time defense and several tools to make your computer secure against autorun virus , worms and a lot more. 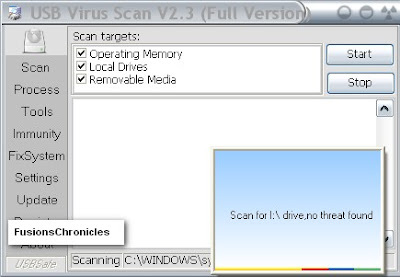 You can set USB Scan to run automatically when Windows start and every time you insert your Flash Drives USB Virus Scanner will automatically remove the threat and displays the scan result in the bottom left of your screen. You can immunize your Hard Drive or USB against viruses and disable USB as you wish. USB Virus Scanner let you fix disabled Taskmanager, Folder Options, Registry, Safe Boot, File Associations and Show Hidden files options for you to make ease your troubleshooting. USB Virus Scan is created by EASYSOFT USB VIRUS SCAN, INC.
USB Disc Security is software created by ZBshareware to fix viruses from Flash Drives or USB Drives. By their very nature, USB keys are prone to infection. You stick them in strange computers, share them with your friends and lend them to people for their files and downloads, so it's no wonder that when you use them, there's a risk that they could end up infecting your computer with something nasty. 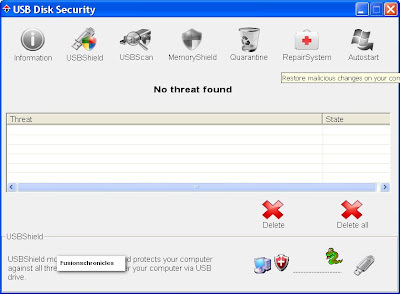 USB Disk Security is a program that aims to detect any virus before this has a chance to happen. Once you install the program it automatically runs when a USB stick is inserted. It checks for infections, and also provides some other features, such as a list of the programs that automatically run at start-up. Although USB Disk Security seems to have other features, such as a USB scan tool and repair options, these are not available in the trial version. When minimized, USB Disk Security will sit in the task tray discreetly. From this menu, you can enable and disable auto-scanning, as well as updating the program. The limitations on the trial version of USB Disk Security are a bit of a disappointment, but the program is so unobtrusive and efficient at scanning recently-inserted USB sticks that it might just be worth downloading anyway. It could protect offline computers with rare update and it doesn't make your computer slow. It is a real time defense against malicious programs that automatically runs while opening your files on Flash Drives. Autorun Eater is another program designed to block autorun or any threats via USB Drives. Autorun Eater was born due to increase of malwares using the 'autorun.inf' tactic to infect users unknowingly be it from flash drives, removable hard disks or any other removable storage device. When a device is infected the malware dropped an 'autorun.inf' file and the shell menu is normally modified to execute the malware whenever the unsuspecting user double-clicks the infected drive. Most anti-malware apps out there will almost instantly remove any malware detected but more often than not they leave the 'autorun.inf' file behind. And what if the anti-malware app fails to catch the malware? Here is when Autorun Eater comes in handy. Autorun Eater will remove any suspicious 'autorun.inf' files even before the user attempts to access the drive. These files are auto-backup'ed in case of false positives.